Man!!! 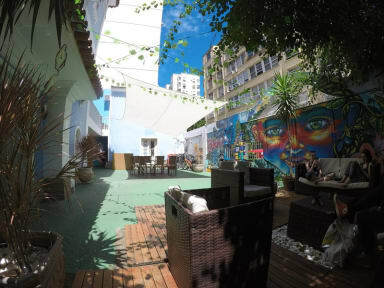 This is a party hostel and great wide garden to meet other travellers ! Breakfast is great and crew is friendly . I liked the location, the reception staff and the cleaning ladies are excellent. They do their best to keep a huge hostel clean and tidy at all time. I hope the managers appreciate and compensate them for their hard work. The hostel is so comfortable. The floor was so clean, as well as the dorm and the shower. There’s a lot of shower room and toilet so I never have to wait for using it. The hostel was also smell so nice, I love it. The bed was comfortable, the room was spacious to pack and unpack my stuffs. The kitchen was complete with all the utensils you need. There’s so cozy communal room with lota of sofas and its a nice place to meet other traveller. There’s also a nice teracce to spend some time there. It was easy to check-in/out, the staff was friendly and available 24/7, the room was clean and they provided linen and towels and they had free breakfast and wi-fi available. The location was good as well! Would definitely recommend this place! Aurora hostel had a great vibe, it was exactly what we were looking for. The location was good, short walk to the metro. The staff were very friendly, especially Santiago because he made me a sandwich :) They also ran a programme to help feed the homesless, so we volunteered with that which was very rewarding. I'd highly recommend. 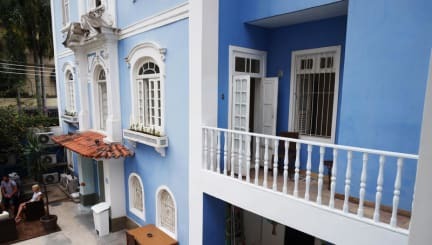 Great location, in the heart of Botafogo with great cafes and shops nearby. Roomy sleeping quarters with lockers you can store your things in (bring a padlock). No locks anywhere in the hostel so anyone could theoretically come in, so make sure to lock your stuff up. Some of the staff were helpful with great English. Some however, were quite abrupt and almost rude. Its definitely a party hostel, music til the late hours. Bathrooms could have been cleaner/ in better condition. I am really baffled by why this hostel has such good reason reviews - it was expensive, dirty (particularly the bathrooms), the beds were uncomfortable and rubbery, the showers were cold and the staff were actively unhelpful. I stayed during carnival and it felt like the guests were an inconvenience to the staff as they were getting in the way of the staff getting wasted. There was an electronic gate to access the hostel but it was always open. The air conditioning and breakfast were good.